2 by 3 Heroes: Billy's from all directions. It's been a good week with the Billy Pierce project in 2x3 Heroes headquarters. A total of 5 cards have arrived and been cataloged into the system, and they have come from every direction possible. In one of my last posts, I showed off a sweet Dannon sponsored White Sox team set I received. There was one card I didn't share in that post - a card I had no idea would be arriving from a package sent by Mrhavercamp (James). 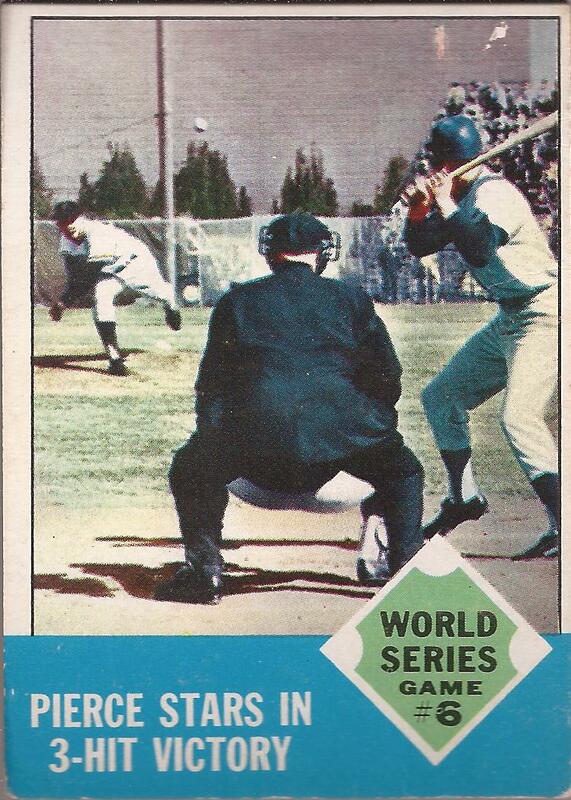 That's a nice 1963 Topps World Series card of Billy. It was a glorious addition to the cards James sent. I totally feel like I gipped him on the trade. Luckily, I have his address. PWE BOMBS!!! A couple of days later, Chris and Kyle from Old Foul Cardboard, who by the way you all should be doing your own Yankee PWE bombs on for Kyle's sake, sent me a few Sox cards and vintage Blackhawks (for another post). Included were these two beauts. Yup - the same 63 Topps. I get it twice in 3 days. I am not worried or sad. Who wouldn't love that card more than once? 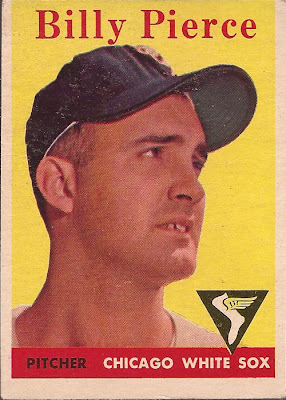 I mean - Tim Wallach has over 6000 total cards of only 305 different variations. He knows what I am talking about. The 60 Topps is also a dupe, but it's an upgrade to the card I currently have. I had never had a plan what I would do when I upgraded a few of the cards, but I think I will get them autographed. So thanks a bunch to Chris and Kyle. PWE bomb them too. That's 78.74 inches in Imperial units. Moving on to eBay, I routinely do a "Bill Pierce" and a "Billy Pierce" search to find things that may slip under the radar. I scored my 53 Bowman for under $6 on the 'bay. I was surprised when I found the 1952 Red Man card listed for a very low starting price. I had a price in mind and was able to snipe the card over someone else for under $10 with shipping. Can't even guess what "book value" is has, but I love it and want it, and now I have it. To hell with the book value. With the bottom tab too. The only blemish is the slight ding in the upper right. It's sooooo worth it for the price I paid and the rest of the card's condition. And lastly, we head over to Listia. Side tangent - I am lucky enough to work from home 4 days a week. I recent discovered the joy of surveys on Listia. Needless to say, I have earned about 17k in Listia credits from all the surveys I have filled out. My junk email will get a work out, but it's all in the name of science. Well, greed really. Anyway, a 1962 Topps Pierce showed up. I have almost pulled the trigger on one at COMC, but the price feels strangely high in my opinion. 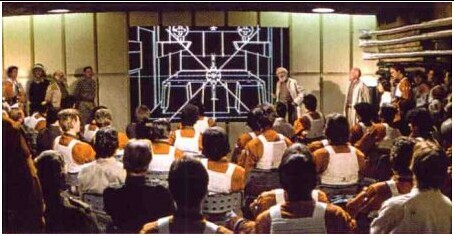 But I would be willing to go "10 dollars" on Listia for it - 3000 credits. Before surveys, I had but 1500 creds to spend. Now I capital. My spotter helped me line up my target and SNIPE! Scored for 2711 creds. Now, the PWE mailing was scary - penny sleeve and folded in a piece of paper, but it survived and arrived today. Worst centering of all my Pierces, but otherwise is in fine shape. I am down to 9 cards to complete my set. 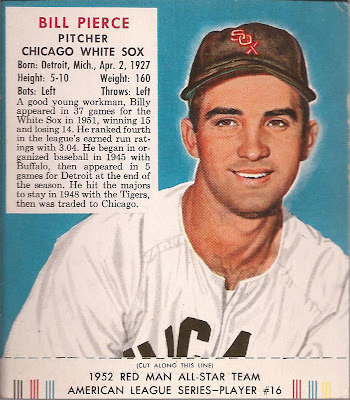 Now technically, there are a couple Post cards out there of Billy. I do not have them on my list, but I have a line on acquiring them, so if/when I get them, I will just add them to the list. Let's welcome the newest members of the project. 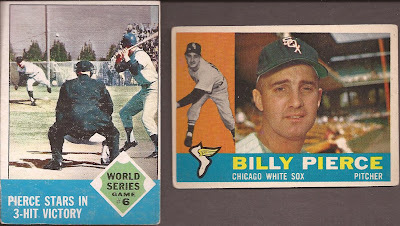 Some great cards o' Billy there.